Rubbermaid’s WaveBrake High-Capacity Bucket/Wringer Mopping System features a revolutionary, patented design that reduces splashing, resulting in cleaner floors and a safer environment for employees and customers. With the massive 44-quart capacity, you can tackle even the largest commercial cleaning jobs quickly and efficiently. The heavy-duty, ergonomic side press wringer is designed to last over 50,000 cycles. The convenient foot pedal drain allows for easy emptying with no heavy lifting, preventing back strain. 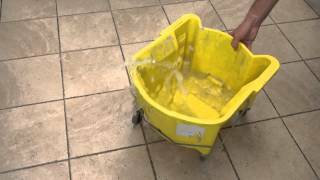 Designed to keep your mop handle secure during transport, preventing damage to walls or injury to the user. The non-marking 3” casters will also keep walls and doorways safe from damage. For use with 16 to 32-oz. mop heads. Accepts RCP 9C74 Dirty Water Bucket (sold separately). Constructed of tubular steel and structural web molded plastic. Yellow.